DAMASCUS GATE – The road to Damascus once came out of this Gate, you will also notice a smaller Roman Gate to the left, it would have been the Gate the Messiah came through with the Cross. 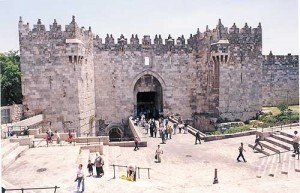 The Damascus Gate is located on the northern wall, it is the busiest and most magnificent of all Jerusalem’s gates. It consists of one large center gate originally intended for use by persons of high station, and two smaller side entrances for commoners. 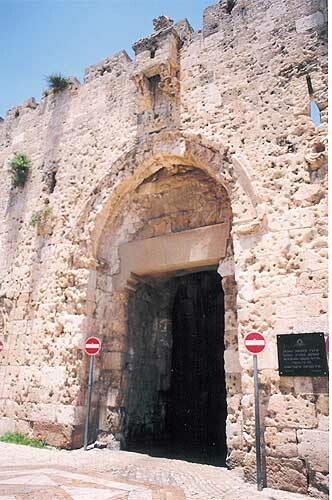 DUNG GATE – This Gate leads into the Temple Mount Area and the Western Wall of the Temple Mount. Solomon’s stables were close to this gate. The Dung Gate is located in the south wall. Since the 2nd century, refuse has been hauled out of the city through this gate, hence the name Dung Gate. HEROD’S GATE – Herod’s Gate is in East Jerusalem located on the North Wall of the Old City and leads into the Moslem quarter of the Old City. 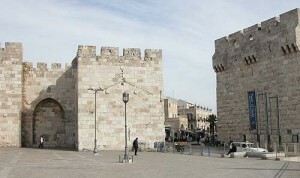 JAFFA GATE – The Jaffa Gate is located on the Western wall of the Old City. This gate has a lot of history over the past 100 years. The Jaffa gate marked the end of the highway leading from the Jaffa coast and now leads into the Muslim and Armenian quarters. 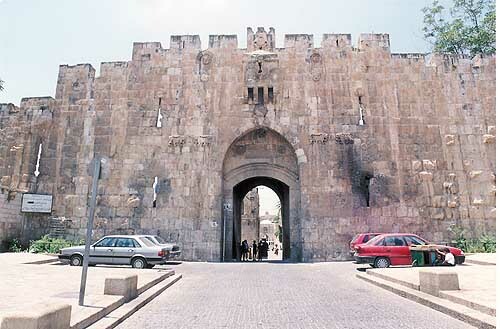 A road allows cars to enter the Old City through a wide gap in the wall between Jaffa Gate and the Citadel. This passage was originally opened in 1898 when Kaiser Wilhelm II of Germany visited Jerusalem. The ruling Ottoman Turks opened it so the German Emperor would not have to dismount his carriage to enter the city. LION’S GATE – The Lions Gate is also known as St. Stephen’s Gate, it is the location that Paul (Saul) witnessed the stoneing of Steven. The Lion’s Gate is located in the east wall, and leads to the Via Dolorosa. Near the top of the Lion’s Gate are four figures of lions, two on the left and two on the right. Israeli paratroops from the 55th Paratroop Brigade came through this gate during the Six Day War in 1967. 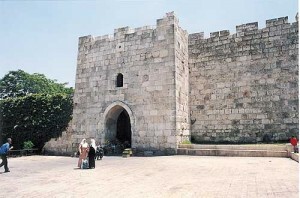 NEW GATE – The New Gate is located on the north west corner of the old city walls. Yes, the New Gate is about 600 years old. It is the newest gate and it was remodeled in 1889. 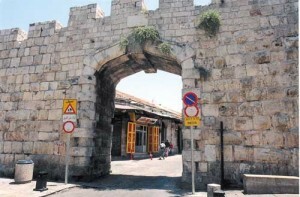 Zion Gate – The Zion Gate is located in the south part of the Old City. 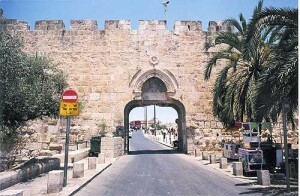 The Zion Gate was used by the Israel Defense Forces in 1967 to enter and capture the Old City. The stones surrounding the gate are still pockmarked by weapons fire. 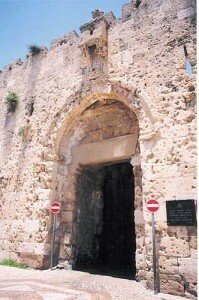 This entrance leads to the Jewish and Armenian quarters. 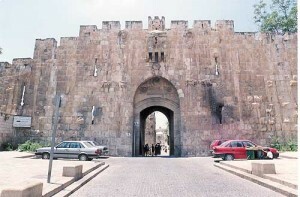 You can see the bullet holes in the gate from the 6 day war in 1967. GOLDEN GATE – You will notice is closed, The Moslems know the Jewish Messiah will come throught this Gate, so they filled it with 16 feet of cement. They also know a Gadol Cohen (High Priest) can’t walk in a grave yard so they bury their dead there. 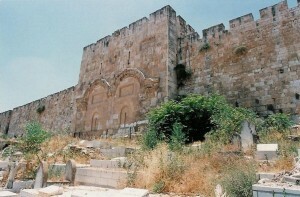 The Golden Gate faces the Mount of Olives on the East wall of the Old City. The Golden Gate was constructed in the post-Byzantine period and the Muslims sealed the gate during the rule of Suleiman.